The doctrine of accretion and erosion holds that the littoral boundaries to coastal properties change with the gradual and imperceptible movement of the mean high-water mark. This article examines the extent to which the doctrine applies where erosion is artificially caused. 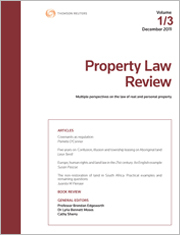 After examining the key authorities and the rationale of the doctrine, the author contends that boundaries should not change where the state causes the erosion of private property intentionally or where it was reasonably foreseeable that erosion would occur. Reasons are also suggested for why the doctrine should not apply where a property owner is restricted by the state from protecting against naturally occurring erosion. Indigenous Land Use Agreements (“ILUAs”) are a legal tool created by the Commonwealth Native Title Act to facilitate the making of binding agreements between the “native title group”, including native titleholders and registered claimants, and governments, companies, and individuals. A key concern in relation to ILUAs is how to ensure their continued enforceability where the non-native title party changes, for example where holder of a mining or pastoral tenure transfers their interest to a third party. Of particular concern are Queensland ILUAs between a native title group and pastoralist where the pastoral lease is assigned to a third party. This paper examines the enforceability of terms in pastoral lease ILUAs against assignees of such leases as well as the enforceability of terms by the assignees against the native title group. A range of options, including the creation of native title easements, are canvassed in the search for a workable solution to the problem. Short-term Airbnb style accommodation, being short-term rentals (STRs), is now a significant component of “property in the city” across the world and is occurring in nearly all cities across the globe, irrespective of whether this form of housing is legal according to regulations. This article will look at why and how governments are trying to control this activity which, to borrow Karl Polyani’s metaphor, effectively “dis-embeds” properties from local neighbourhoods and “re-embeds” them in a global network of STRs, facilitated by companies such as Airbnb, which reaches into thousands of cities across the world. Using desk-based analysis of government documents, newspaper articles, legislation and case law, industry reports and other online sources, we draw on the experiences of several global cities – focusing in more detail on two Australian cities that have seen a large uptake of STRs, Sydney and Melbourne – to interrogate the motivations for regulation and to identify in what “realm” (eg, land-use planning, property, etc) attempts to regulate STRs are being introduced and tested through case law. For the PDF version of the table of contents, click here: Prop L Rev Vol 7 No 2 Contents.